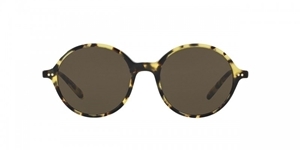 OLIVER PEOPLES CORBY IS A DISTINCTIVE STYLISH FEMININE FRAME COMPRISING OF ACETATE AND DETAILING OF ETCHED METAL. OLIVER PEOPLES CORBY IS A MINIMAL BRANDED FRAME FEATURING THE LOGO PLAQUE ON THE END TIPS. A MIX OF HIGHLY DETAILED BLACK FILIGREE WITH VDTBK FRAME. THE LENSES ARE STANDARD GREEN 15. EYE SIZE IS 51 ,BRIDGE 19 ,TEMPLE 145. A BESTSELLER OF THE OLIVER PEOPLES RANGE THAT KEEPS ON ADDING TO THE CLASSIC DESIGN ETHOS IT STANDS TO DELIVER.